Staff photo by Steve Muscatelllo Sleepy Eye’s Blake Tauer is tackled by two Minneota defenders after making a catch in the first quarter Thursday in Sleepy Eye. 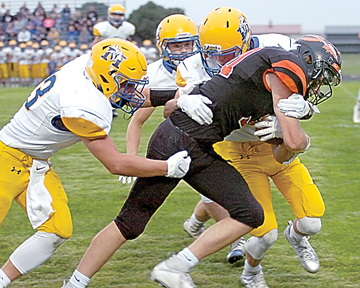 SLEEPY EYE — The Sleepy Eye Indians kicked of its season as the defending Class A State champion Minneota Vikings came to town in a Southwest District matchup on Thursday night. The Indians came up short with a 23-8 loss. The game was tied 8-8 at halftime, with the Vikings scoring late in the game to control the clock and capitalize on some turnovers late in the game. Sleepy Eye scored first on its first drive of the game when Landon Strong got a 1-yard touchdown run with the Indians facing fourth-and-goal. “We did some good things with Keegan Heiderscheidt, our quarterback who showed a lot of poise tonight, and we have some great senior leadership,” Indians coach Cory Haala said of the scoring drive. Sleepy Eye’s drive was started after Minneota drove all the way down to the Indians’ 17-yard line on its first possession of the game. Sleepy Eye’s Ethan Fischer got a hand on the ball when he broke up a pass on third-and-goal with 6:45 left in the first quarter. With the Vikings facing fourth-and-goal, Indians linebacker Jacob Berg penetrated the line for a sack, with Sleepy Eye taking the turnover on downs at their own 17-yard line. Fischer had a 17-yard run from the Minneota 27 to bring the Indians close on the scoring drive. 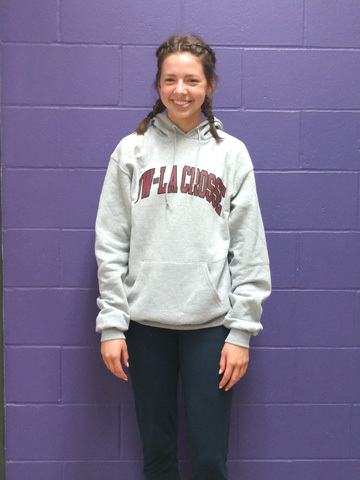 The Indians held a fourth- and-goal from the 2 when Heiderscheidt drew the defense offsides to move 1 yard closer. Strong carried the ball to the left side from a pitch out into the end zone and Berg followed with the 2-point conversion across the goal line to lead 8-0 with 8:49 left to play in the first half. The Indians defense had a tremendous effort in the late minutes of the first half by forcing the Vikings to punt on a fourth-and-12 to get the ball back with just over five minutes left in the half. Minneota drove the ball 75 yards in just under two minutes for a 4-yard touchdown run with a completed 2-point conversion to tie the game with 3:01 left to play in the half. The Indians had a chance to come away with more points in the first half when Nathan Walter broke a tackle in the backfield to run 43 yards to the Vikings’ 20, but the play was called back on an offensive holding to push the Indians deep into their own territory. Blake Tauer later came in strong and gave his offense a chance when he collected a sack to give Sleepy Eye the ball back with 26 seconds left on the clock for a huge red-zone stop. The Vikings scored late in the third quarter, capitalizing on an interception at their own 37-yard line. After being backed up by penalties, the Vikings completed a 50-yard passing touchdown to lead 16-8. Minneota’s final scoring drive came with two minutes left on the clock and running out of the wildcat formation trying to speed the clock up.